The Dynamics GP Blogster: How many Report Options can I create for any given report? Straight to the answer: you can have up to 32,767 report options for any given report. The number comes from the size limitations imposed to the Dexterity drop-down list control. You may be saying, "but, I was told that you can have 32, where does the number 32 come from?". 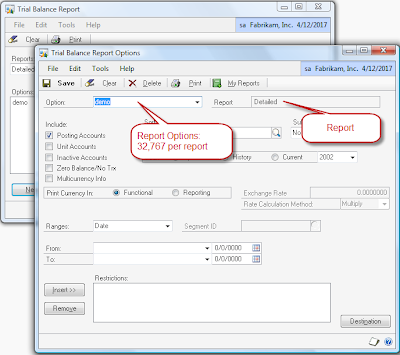 32 is the number of report options that can be assigned to any given report group. Now this limitation stood up to version 8 (see KB article 849505) and I am not sure it has changed for v9 and v10, but if you test it out and find a different value, I would love to hear from you. I don't think it was a bug, but rather a self-imposed limitation. This is standard functionality that has been in the app since ever. See the second part of my post.